Picture scanned from Time Capsule. 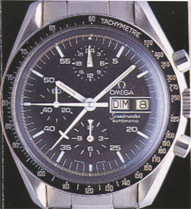 Omega launched the Speedmaster in 1957. At this time they haven't realized that they've created a real Classics which will be in production for more than 40 years. After some design-changes, e.g. case diameter, hands, crown and pushers protection, Omega build up the Speedmaster collection in the late 60s with the Mark II and following models. 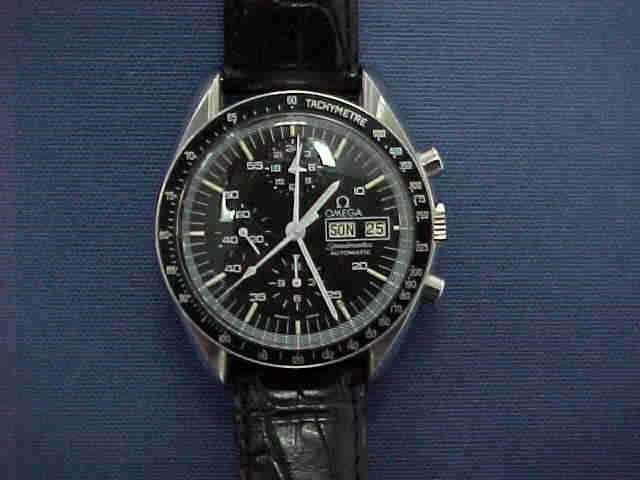 1975 Omega used the Cal 1045, based on Lemania 5100, the first time in a Speedmaster. It was 70s design, looking like a TV-screen. 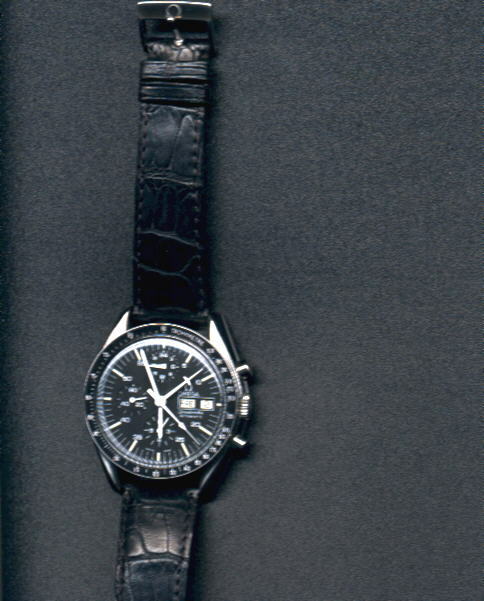 In 1987 Omega launched the Speedmaster Automatic, the topic of this review. 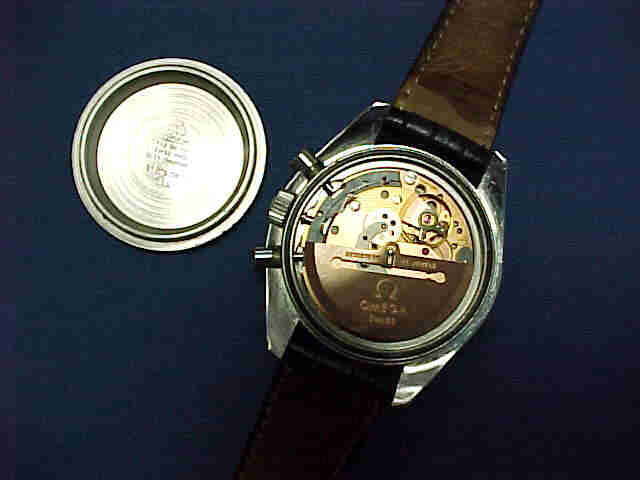 After buying and selling several Moonwatches I bought a cal.321 pre moon in like new condition with box and papers in Feb. 1999. After some weeks I was offered a cal.1045 Speedmaster by a dealer. The condition was rated 9 of 10 and the price was fair, so I bought it. In my opinion the Speedmaster is the most underrated watch on the market. On the first look the case seems to be the same like the moonwatch case. That's only half of the truth. To fit the 1045 movement, the case is a bit higher than the hand winding one. On the bottom you can see the engraved seahorse but without the famous words.The second part of the case is about 1mm thicker and more massive. It has crown and pushers protection. The diameter is the same, 41,5mm. Day and date on 3, 12 hours on 6, constant second on 9, chrongraphs second and minute from the center and on 12 a 24 hour subdial. The tritium is still strong, my watch is dated from 1987. The water resistance is rated to 30m, but I'll never wear it for swimming because of the strap. I wear my Speedmasters all with black Croco strap. For me it looks much more elegant than the older ss-bracelets. I change the straps once a year becuase I only wear them in the winter. Nowadays an acrylic crystal is not standard, but I love it on the Speedmaster because of the autenticy. You can polish it easily when it'll be scratched. The bazel is the standard scaled tachymeter. The accuracy is very good, less than 1 min. a week. Wearing my watch not every day, the quickset for day and date is very comfortable. Pull the 7mm crown in the first position and turning it up you can set the date, turning it down set the day. The second position is for the time. 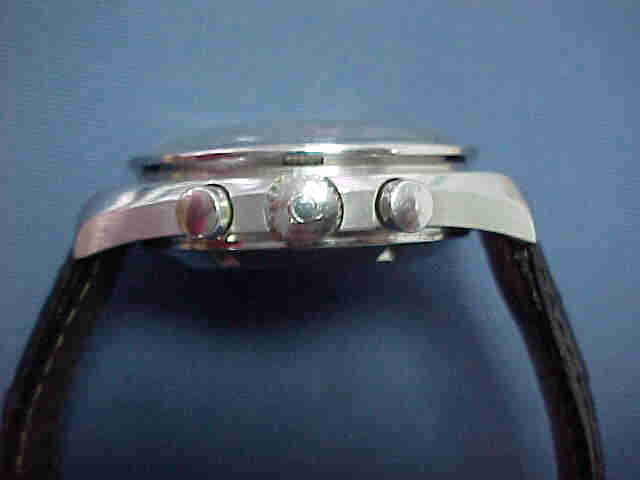 The watch is in very good condition, a service is not necessary. Because of the auto-movement the weight of the watch is about 25% higher than the hand winder. The comfort of wearing it is not as high as the Moonwatch because the watch is higher and have more weight. For me it's no problem, I prefer big watches, e.g. Rolex Sea-Dweller, AP Royal Oak Jumbo. For me the 1045 is one of the most collectable Speedmasters. For a fair amount you get a timeless classic Chrono with the advantage of an automatic movement and day/date function. I wear it more than my pre-moon 321. Some weeks ago I bought a CK 2998 dated to 1959. It's still under restoration. You'll see it in a few weeks.